Researchers from the RIKEN Center for Emergent Matter Science have managed for the first time to observe a square lattice of merons and antimerons - tiny magnetic vortices and antivortices. The magnetic merons (and antimerons) were formed in a thin plate of the helical magnet Co8Zn9Mn3. 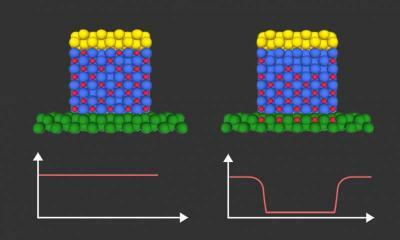 The researchers were also able to induce a transformation between the square lattice of merons-antimerons and a hexagonal lattice of skyrmions, by finely varying a magnetic field applied perpendicularly to the thin film material. Researchers from MIT and the DoE Brookhaven National Laboratory designed a way to use hydrogen ions, drawn from airborne water molecules at room temperature, to electrically control magnetism in a thin magnetic film. The thin-film was made from cobalt, palladium and gadolinium oxide on a platinum base - and gold contacts. The hydrogen ions are used for reversible magneto-ionic switching in the thin film. This is the first time that scientists have demonstrated reversible “hydriding” of a heavy metal. 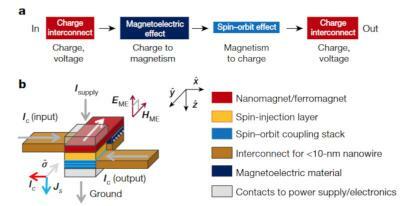 Researchers from Intel and the University of California in Berkeley developed a new scalable spintronics logic deice, which they magneto-electric spin-orbit (MESO) logic device that offers dramatic improvement over current CMOS technology. Intel says that MESO based logic, compared to CMOS, will offer a superior switching energy (by a factor of 10 to 30), lower switching voltage (by a factor of 5), an enhanced logic density (by a factor of 5) and ultra low standby power (due to the non-volatility of the spin-based device). Researchers from the University of Würzburg managed to create a molecular spintronics switch, using a manganese phthalocyanine molecule. The researchers succeeded in manipulating this molecule using a special deposit and an electrical field to permanently take on two different states. This molecule cannot be normally switched, but the researchers managed to develop the switch by placing the molecule on metallic surface built from silver and bismuth atoms. Researchers from MIT and the Brookhaven National Laboratory have demonstrated how the magnetic properties of thin-film materials can be controlled be using electrically-controlled hydrogen ions. The researchers say that this new mechanism is much faster and has many advantages over the current method using larger oxygen ions.The researchers have also demonstrated that the process produces no degradation of the material after more than 2,000 cycles. As the hydrogen ions are smaller, they can easily pass through metal layers, which allows to control properties of layers deep in a device that couldn't be controlled in any other way.